Space probes have been crashing into moons and planets since the dawn of the space age. Sometimes it's purely by accident: several Soviet moon probes made a harder landing than planned back in the 1960s, and NASA's Mars Climate Orbiter was lost in 1999 when engineers charting its trajectory forgot to convert from English units to metric. But there are plenty of good reasons to crash on purpose. The Ranger spacecraft in the early 1960s got astounding closeups of the moon the only way you could in those days: bore in at high speed and snap hundreds of quick shots to be transmitted home during the plunge toward impact. A few years ago, a probe from NASA's Deep Impact spacecraft crashed into Comet Tempel 1, sending up a cloud of debris for the main craft to analyze. 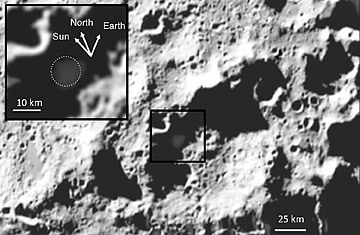 And almost exactly a year ago, a NASA mission called LCROSS (Lunar Crater Observation and Sensing Satellite) did something similar, aiming a spent Centaur rocket booster to blast a hole in the floor of Cabeus crater, near the moon's south pole, so the trailing LCROSS probe could see what came out before crashing itself four minutes or so later. Unlike the other suicide plunges, though, this one had a goal that was as much practical as it was purely scientific. If humans are ever going to establish any sort of base on the moon, it'll be a lot easier with a local source of water; the stuff is, after all, awfully heavy to lug all the way from Earth. So LCROSS went out to find some. And in six separate papers published today in Science, researchers across a wide range of disciplines showed that it's there all right, in the form of ice  and in impressive amounts. "There's 50% more water in the ejecta plume than we expected," said Michael Wargo, the chief lunar scientist in NASA's impressively named Exploration Systems Mission Directorate, at a press conference. "We also saw light hydrocarbons, hydrogen, carbon dioxide, mercury and even silver." It was the water they went for, however, and although it was clear right away that they'd found some, only now have they been able to nail down the amount: more than 5% by weight of the debris cloud blasted into the lunar sky by the Centaur booster. "That's about twice as wet as the Sahara," said Anthony Colaprete, principal investigator of the LCROSS mission. That would be faint praise if you weren't talking about a world long considered to be without any water at all. It gets better. Investigators had long suspected that the craters at the moon's poles would be the best places to find ice, because these permanently shadowed regions are, at about -380°F (-229°C), among the coldest places in the solar system  colder than the frigid atmosphere of Neptune, the farthest planet from the sun. "Theoretically, there may be bodies this cold in the outer fringes of the solar system" said David Paige, of the University of California, Los Angeles, "but nobody's ever observed them." Such bitterly cold temperatures on the moon mean that any ice that finds its way into craters like Cabeus  from comet impacts, say, or even from water created in minute amounts when the solar wind hits the lunar surface and causes chemical reactions  will stay frozen indefinitely. Indeed, earlier probes had found circumstantial evidence of at least some ice there before. But not only is there more ice than anyone suspected, it's also in a form  small crystals mixed with crumbly soil  that make it easier to extract than if it were in massive deposits. What's more, the ice doesn't quit at the level of the soil. It's also below the surface in places that do occasionally get sunlight  a kind of lunar permafrost, the scientists call it. If astronauts ever do manage to get back to the moon, they should find it easier to mine for water in these somewhat less frigid and dark conditions. The presence of hydrogen in the soil, meanwhile, could provide a source of fuel for lunar visitors. But while these possibilities are all very real, they're also still pretty theoretical. "We've discovered there's water," said Wargo. "The next step is understanding how it's distributed." It could be in local concentrations, he explained, or it could be spread uniformly through out the soil. "If I'm an astronaut, I want to know: 'How far do I have to walk to find pockets of water? How extensive are they?' We need to start prospecting, to figure out if this is an ore that can be processed reasonably." There's at least one downside to what the scientists found: the surprisingly large amount of mercury seen in the ejecta plume suggests that digging for anything at all could expose the lunar miners to a nastily toxic substance. But there's also a bigger problem: earlier this year, President Obama called for the cancellation of NASA's Constellation program, which would have sent astronauts back to the moon, ultimately to set up a permanent base. A bloc of moon-friendly legislators on Capitol Hill are fighting him, but the prospects for taking advantage of LCROSS's discoveries are pretty dim for the foreseeable future. Read "Now It's Official: There Is Water on the Moon." See Apollo 11 photos by Neil Armstrong and Buzz Aldrin.